For months, Greenpeace UK has been campaigning against Volkswagen's corporate opposition to new environmental laws in Europe. 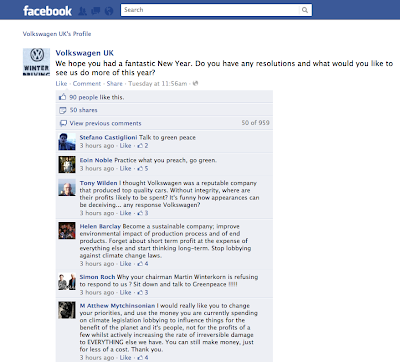 "VW opposes key environmental laws we need if we’re going to stop our planet going the way of Alderaan (bye bye). But all is not lost. We feel the good in Volkswagen. 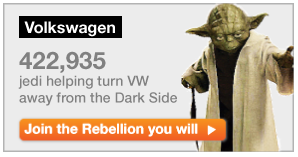 All of us in the Rebellion are calling on Volkswagen to turn away from the Dark Side and give our planet a chance. Despite its green image, Volkswagen is spending millions of Euros every year funding lobby groups who are trying to stop Europe increasing its commitment to greenhouse gas reductions from 20% to 30% by 2020. Progressive companies – from Google to Ikea, Sony, Unilever and Philips – support the target. Volkswagen can’t afford to be left behind. More efficient cars are cheaper to run, use less oil and emit less CO2. Volkswagen has a history of lobbying against the strong European standards that we need to kick our oil addiction. As the biggest car company in Europe, with the biggest responsibility, VW must change and support strong standards from now on. Volkswagen says it wants to be “the most eco-friendly automaker in the world”, but only 6% of the cars it sold in 2010 were its most efficient models. It has the technology to do better. VW must set out its plan to make its entire fleet oil-free by 2040." After the company's admin posted an innocent-enough update, "We hope you had a fantastic New Year. Do you have any resolutions and what would you like to see us do more of this year?" the dogfight began. Almost 1000 damning comments, as of this writing, and not one response. While the organized criticism itself will become a cautionary tale for many big brands on social media, the moral of the story will be lost on most. The key to being an effective social brand is not avoiding, deleting or even ignoring criticism; it is engaging the negative. Chapstick figured that out the hard way when a fairly tame campaign idea went totally off the rails and they responded by deleting negative comments. Commenters just went elsewhere to vent, and the brand lost a key opportunity to learn more about its audience. “We see that not everyone likes our new ad, and please know that we certainly didn’t mean to offend anyone! Our fans and their voices are at the heart of our new advertising campaign, but we know we don’t always get it right. We’ve removed the image and will share a newer ad with our fans soon! 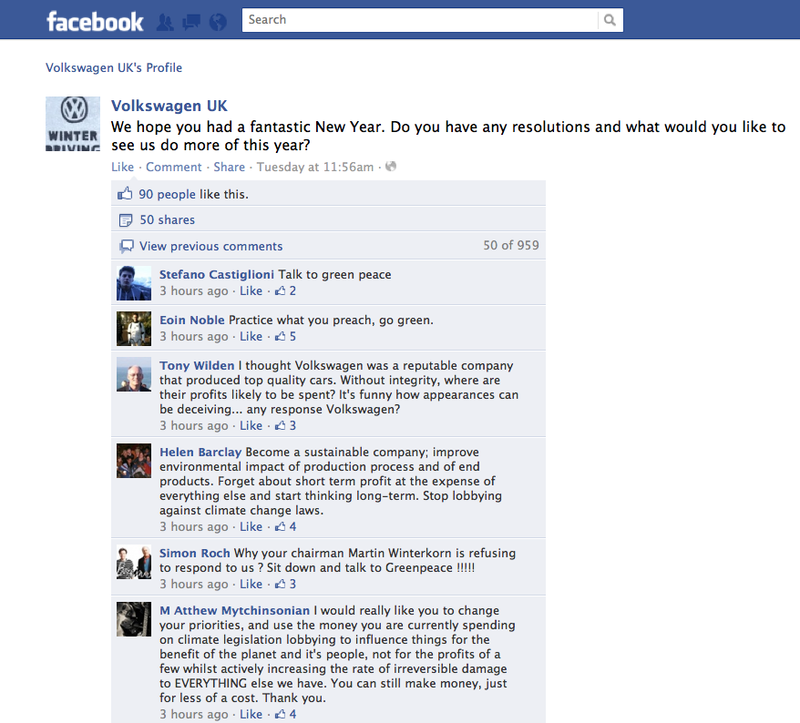 Volkswagen, on the other hand, is either too negligent or too scared to respond on their own Facebook page. And that's a real failure to communicate. 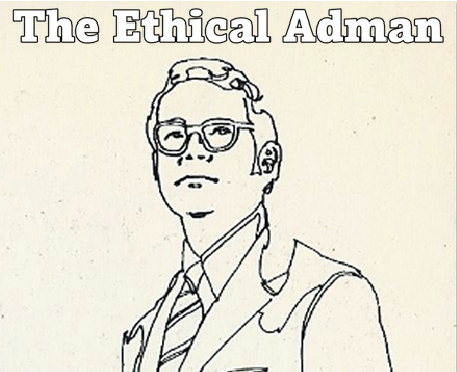 In my experience, every brand or cause has an answer to criticism that won't necessarily be widely accepted, but is rational and at least partly valid. There are two sides to every argument, especially when it comes to awkward issues like greenwashing and corporate social responsibility. Volkswagen UK is being called to task on its side of the story. "We care as much as you do about the environment so we design our cars to have minimal impact on it at every stage: during manufacture, while on the road and at the end of their lives. Of course, we also want you to enjoy driving your Volkswagen. That means our engineers are constantly working to produce cars that offer great performance with better fuel economy and fewer harmful emissions. Our Golf BlueMotion for example, is currently one of the most fuel efficient cars of it class, with CO2 emissions of just 99g/km thanks to its start/stop technology and regenerative braking. Click here to find out more about our BlueMotion technologies. A car doesn't just have an impact on the environment when it's being driven on the road. Download Viavision to see the whole story - from factory to shredder - and to understand how Volkswagen is working to minimise energy consumption, emissions and waste throughout a vehicle's life. So when you decide to drive one of our cars you can feel you're making a choice for a better future, too. Please visit our Mobility and sustainability website or download our mobility and sustainability report for more information on what Volkswagen are doing in the area of mobility and sustainability." But if the Greenpeace accusations of corporate lobbying against tighter environmental standards is true, then they have some 'splainin to do. And that's exactly what they should do... not in the echo chamber of their fan base, but to their most vocal detractors. They should explain what the truth is, what their motives are, and how that fits into their brand. Whether Greenpeace members agree with it or not, they will at least have had their day in court on social media. And if they handle themselves rationally, respectfully, and truthfully (even if it's just "their" truth) they can use this as an opportunity to repair and even grow the reputation of their brand. ...or not. It's been two days already, and the PR nightmare is going global.